As a student, presentations are second nature to me. I can’t even count the amount of times I have had to make visual presentations and slides of information over the course of the past couple years. I’ve always been one to like to change things up, and get bored if I don’t, so rather than always using Google Slides or Microsoft PowerPoint, or even LibreOffice Impress, I’ve opted to use a handy little piece of software called “Spice-Up” on a few occasions. Spice-Up is an entirely exclusive application to GNU/Linux, having originally been created specifically for Elementary OS, so while it may not be quite as powerful as some of its competition, I always love when I get the chance to use exclusive software. Installation of Spice-Up is easily accomplished on many systems, thanks to the availability of a Flatpak, for those who are using systems that utilize the newer technology. Arch users can find Spice-Up in the AUR. Spice can be installed from a PPA. Presentation Browser: Scroll though the presentations you have made and jump right into them with one click!. Controller Support: If you have a USB or Bluetooth controller, plug it in and control your slides! Templates, so you can whip up a presentation in a blink of an eye. Usage is pretty straightforward. You can pick any of the available templates on start or start your presentation from scratch if you prefer that. Use the controls that Spice-Up provides to you to design slides, create new ones, or save the entire presentation to the local system. I will say that you won’t find any extraordinary or rare features, but what you will find is a rock solid application that serves its purpose, is low impact on system resources, and ultimately a great choice for slideshow presentations. If you’re looking for a small but capable application to make presentations with, but haven’t been impressed with some of the other GNU/Linux alternatives, give Spice-Up a look, and see if it suits your needs. 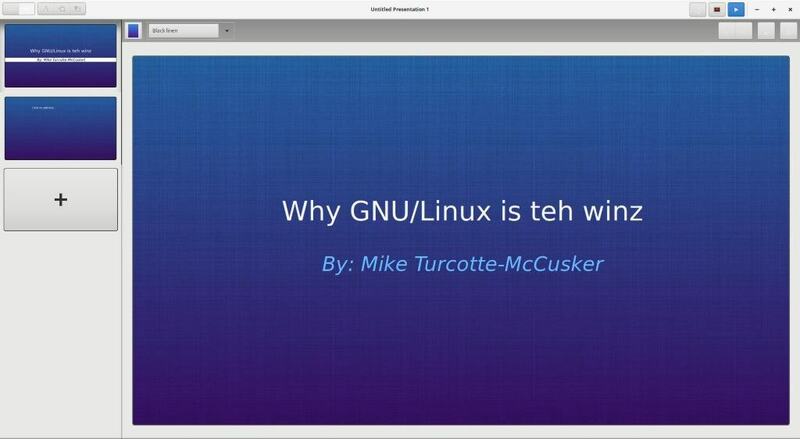 Now you: What is your preference for presentation software, on GNU/Linux systems? Let us know in the comments! A quick look at Spice-Up, a presentation software for GNU/Linux systems that supports templates, embedded images, PDF publishing and more. Thanks for this. How does Spice-Up stack up against LibreOffice Impress? Gerard, I’m not Mike but from a quick look I’d say that Spice-Up is easier to use as it is less feature-rich. Gerard, it’s faster, more responsive, but less feature rich. Spice-Up is to Impress, as Wordpad is to Word/Writer. Is Linux going webapps just the same as windows 10 ? How can I save a file?